With the Obama administration on the brink of launching yet another war in the Middle East, this time extending its resumption of the US intervention in Iraq across the border into Syria, the US media has gone into overdrive in churning out propaganda justifying military action. Exploiting the revulsion over the recent execution of American photojournalist Richard Foley, the attempt is being made to present the Islamic State of Iraq and Syria (ISIS), which has overrun large swathes of both countries, as evil incarnate and an imminent terrorist threat. The leading purveyors of war propaganda are to be found within the pages of the New York Times, the supposedly liberal “newspaper of record.” Among them, no one more exemplifies the integration of the corporate media into the state and the subordination of news and opinion to naked propaganda than the Times ’s foreign affairs columnist Roger Cohen. In the August 25 edition of the paper, a column by Cohen appeared entitled “The making of a disaster.” While Cohen meant the headline to refer to the current situation in Iraq and Syria, it would not make a bad title for his own autobiography. A self-described “liberal interventionist,” he has supported every US military intervention since the 1995 US-NATO war in Bosnia. Few have involved themselves so intimately with top US foreign policy and intelligence circles as Cohen, who has traveled the globe making the case for US aggression and provocations. The ostensible purpose of Cohen’s column is to answer the question “What went wrong?” How is it that “the ‘war on terror’, it seems, produced only a metastasized variety of terror” in the form of ISIS. It all comes down, according to Cohen’s narrative, to a series of “American errors.” He begins with what he calls “Bush’s ill-conceived and bungled war in Iraq.” Like everything in the column, this is nothing but a lie and an evasion. The war wasn’t “ill-conceived and bungled,” it was a criminal act, a war of aggression. It was the result of a conspiracy hatched at the highest levels of the government and military and intelligence apparatus working in cahoots with supposedly independent journalists like Cohen himself. The aim was to foist onto the American people an aggressive war aimed at militarily asserting US hegemony over Iraq and its oil wealth using lies about “weapons of mass destruction” and non-existent ties between Saddam Hussein and Al Qaeda. The “price” included the deliberate stoking of sectarian tensions between the Shiite, Sunni and Kurdish populations as part of a divide-and-rule strategy pursued by the occupation. The imposition of a Shiite sectarian regime under Prime Minister Nouri al-Maliki, who was hand-picked by US authorities, created the conditions in which Al Qaeda, which never existed in Iraq prior to the invasion, found a base of support within the disgruntled Sunni population. Second among the “errors” enumerated by Cohen is “a failure to deal with the fact that two allies, Saudi Arabia and Pakistan, have been major funders of violent Sunni extremism.” Who does he think he is kidding? Saudi Arabia’s and Pakistan’s funding and promotion of “violent Sunni extremism” was carried out in direct collaboration with the CIA in Afghanistan in the 1980s. Moreover, Washington has utilized precisely these “extremists” as proxy forces in its wars for regime change in both Libya and Syria. In both countries, the US provided arms, funding and training to these forces, acting as a principal sponsor of the forces that have emerged under the banner of ISIS. Cohen, it should be recalled, was an enthusiastic supporter of the US-NATO war in Libya, casting it as a “humanitarian” intervention and backing the policy of using the Islamist militias as NATO’s ground troops. After the toppling and murder of Libyan leader Muammar Gaddafi, he hailed the war in a column entitled “Score One for Interventionism.” Today, three years later, the Islamists have overrun Tripoli, and the country is descending into bloody civil war. The heart of Cohen’s indictment of US errors, however, comes down to the failure of the Obama administration to launch a war on Syria a year ago, using the phony pretext that the government of President Bashar al-Assad had used chemical weapons in the civil war with the Islamist-led “rebels.” Ample evidence has since emerged that it was the “rebels” themselves who staged the chemical weapons attacks in an attempt to provoke a US intervention. Out of such logic grow the twin forces of militarism and dictatorship. The rehashing of Obama’s “errors” in not going to war a year ago in Syria has an obvious purpose—that of preparing a war today. Having failed to drag the American people into another imperialist bloodbath based on lies about “weapons of mass destruction,” Washington and its propagandists like Cohen will attempt to do so once again by invoking the threat of “terrorism.” The same lies used to justify the invasion of Iraq are being recycled. More than a decade after the invasion of Iraq, no one has been held accountable for the so-called errors—more accurately defined as war crimes—cited by Cohen. The principal crime committed by Bush, Cheney, Rumsfeld, Rice and other top US officials, that of aggressive war, was the main charge leveled against the surviving leaders of Hitler’s Third Reich in the Nuremberg Trials. Among those prosecuted were the Nazi regime’s chief media propagandists, who were charged with “the false presentation of facts…. 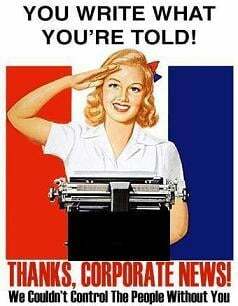 The dissemination of provocative lies and the systematic deception of public opinion,” all to promote aggressive war. This indictment speaks with equal force to the role played by Cohen and the other willing war propagandists of the US media.